Of all circulating denominations of United States coins the 20-cent piece, sometimes called the double dime, was the shortest lived. Examples were made for circulation for only two years, 1875 and 1876, followed by two years of Proofs for collectors. 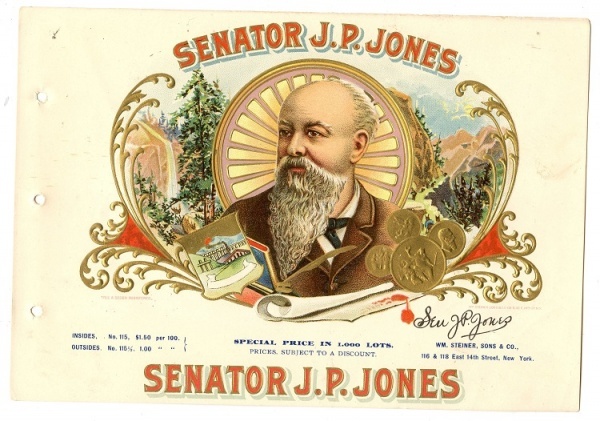 In February 1874 Senator John P. Jones of Nevada introduced a bill for the 20-cent piece. At the time Nevada was America’s leading silver-producing state. While fortunes from the Comstock Lode in Virginia City, Nevada, had been at a high crest in the 1860s and had prompted the establishment of the Carson City Mint a few miles away from Virginia City, by the 1870s the price of the metal had fallen, and times were difficult. New markets were needed. Certainly, a new silver denomination such as the 20-cent piece would help. Jones in his proposal suggested that the 20-cent piece would facilitate change-making and help eliminate the use of Spanish-American coins. He seems to have forgotten that two dimes such as were being made in quantity at the San Francisco Mint would have done just as well. On March 3, 1875, the 20-cent piece became legal. Patterns had been prepared to begin in 1874, a final design had been selected, and coinage started in earnest. 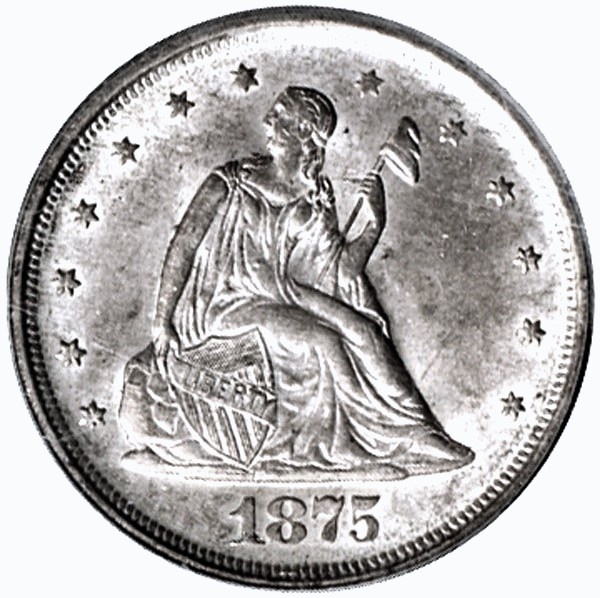 The obverse featured Christian Gobrecht’s motif of Miss Liberty in a seated position, stars surrounding, and the date below. The reverse displayed a motif by William Barber and depicted a perched eagle, somewhat similar in configuration to that used on the Trade dollar, surrounded by UNITED STATES OF AMERICA and the denomination expressed as TWENTY CENTS. The edge is plain, unlike other silver denominations of the era (which had reeded edges). 1875 Philadelphia Mint: 36,910 coins. 1875-CC (Carson City Mint): 133,290. 1875-S (San Francisco Mint): 1,155,000. The Philadelphia Mint coins were not placed into circulation at the time, but the Carson City and San Francisco pieces were. It was soon realized that just because a coin of this denomination was available, merchants did not necessarily change their habits, and the piece was a failure virtually at its inception. They were immediately confused with quarter dollars of somewhat similar size and design. 1876 Philadelphia Mint: 14,640 coins. 1876-CC (Carson City Mint): 10,000. 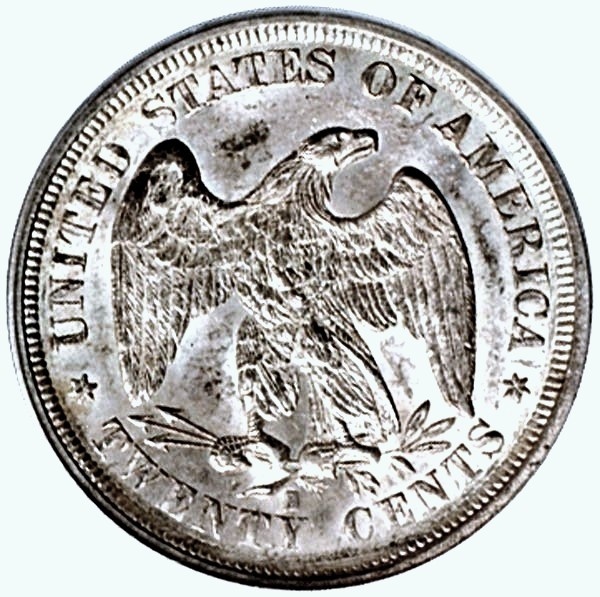 After that time, coinage of the 20-cent piece was limited to several hundred Proofs each year for collectors, 1877 and 1878, after which the denomination was no more. 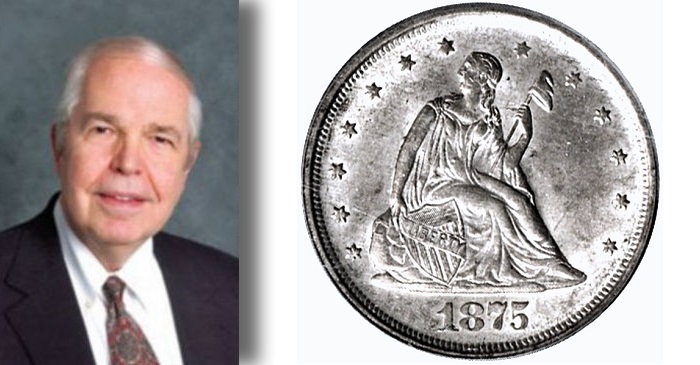 In 1878, Senator John Sherman testified before a House committee about the 20-cent piece and said that it had been created “only because Senator Jones asked for it.” Dr. Henry R. Linderman in his book, Money and Legal Tender, said it was a mistake to introduce the piece, but that it was a proper denomination between a dime and a half dollar and should have been used instead of a quarter dollar. It will be recalled that there is no $25 bill. Thanks for a great article. It brings back memories from the good days of the “rare coin review.” Any thoughts of starting it up again?! I had to get at least one 20 Cent Piece in my collection to represent the obsolete coinage. Same for the 1/2 Cent Pieces, 2 Cent Piece, the 3 Cent Silver and the 3 Cent Nickel and the Silver Half Dime. Most people don’t realize those denominations ever existed so they are essential if you want your collection to tell the story of US coinage. I love reading articles on the history of our coinage and this one definitely answered the questions as to why the 20 Cent Piece began and why it was so short lived.